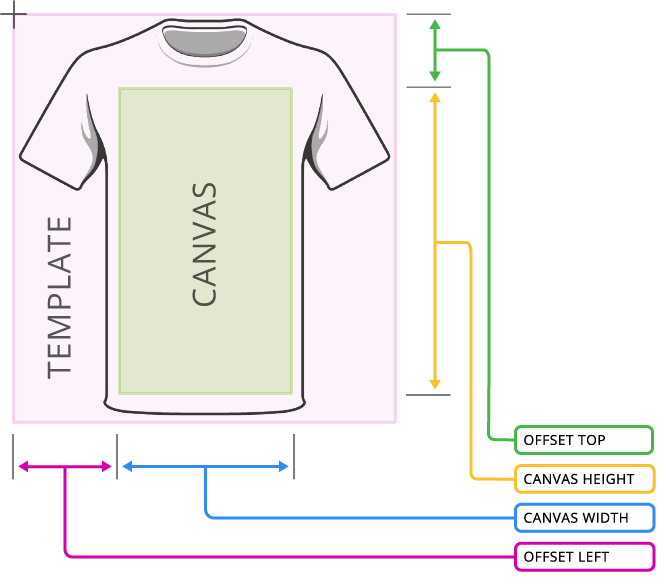 PitchPrint can handle several design types and in most cases, there are one or two ways to implement your design ideas by thinking through how the PitchPrint canvas are arranged. So, let’s first understand the four different layers in this application and then thinker on how they can be combined to achieve common design ideas. The 4 layers are Template, Background, Canvas and Foreground. Template: This is the lowest layer among the four layers (Purple in the picture above) and can only contain one image. In most common designs, this layer is dormant. It is used mainly as a viewing stage for the actual product. To help the customer see how their work will appear on the finished product. When a Template layer is used, the Product Width & Height defines the actual final product dimensions and not the Main Canvas’ dimensions. 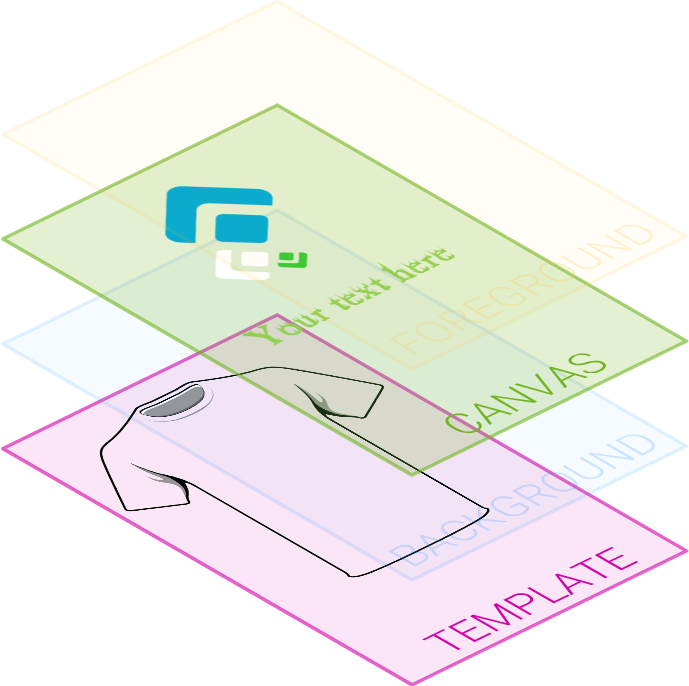 So in the case of our T-Shirt example, you still need to specify the dimension of the area where customers can design and position same using the Canvas Width, Height, Left and Top properties as shown above. Background: The background layer is just above the template and below the canvas layer. When customers edit background in the app, this is what they manipulate. This layer can be an image or a solid color. Canvas: This is where the action is at. 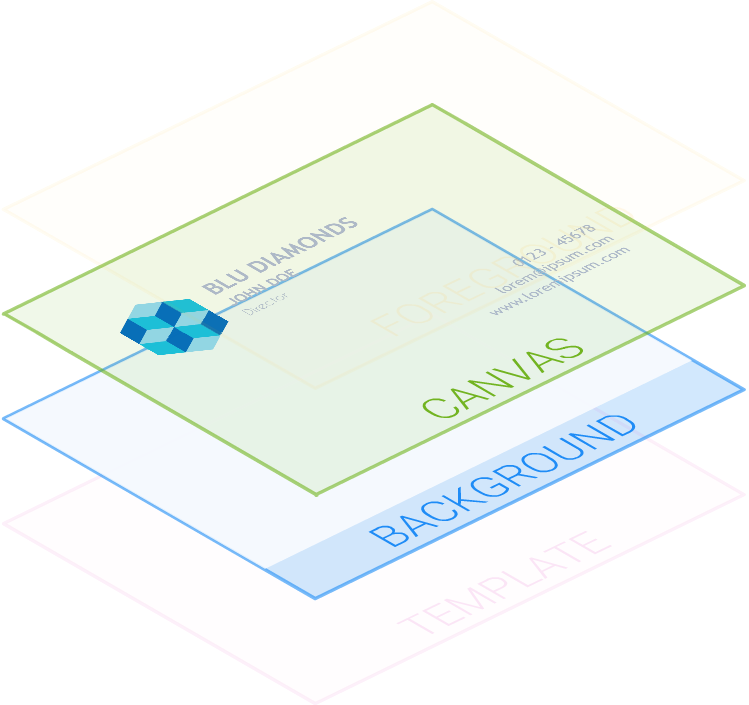 This is the canvas your customer gets to interact with and place items upon like Shapes, Texts and Images. All designs make use of this canvas. When users click to select items, they click on this canvas, not the template beneath it or the foreground above it. 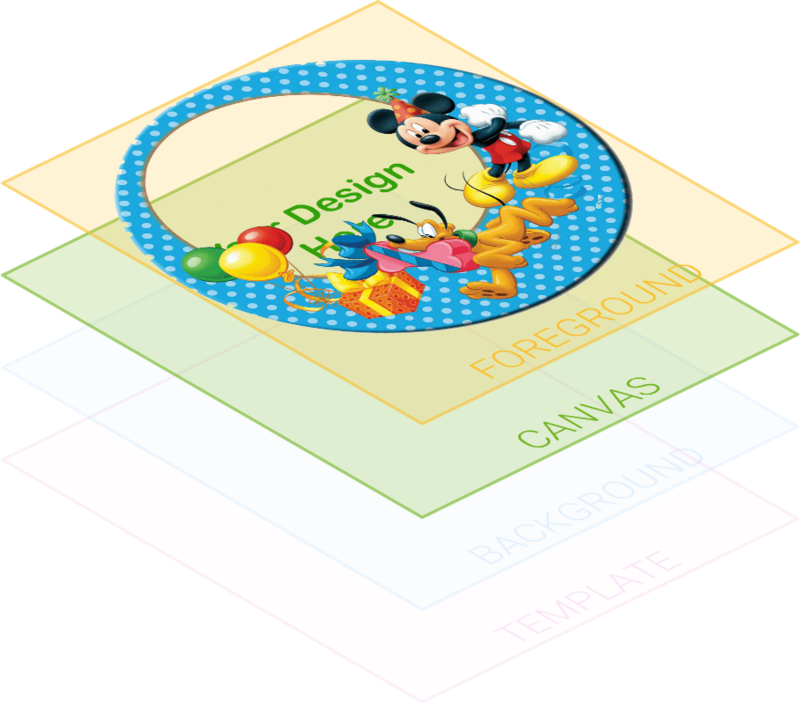 Its dimensions are set based on either the Product Width & Height or the Canvas Width & Height if a template is utilized. In situations where a Template it used, there is likelihood you want to offset the canvas to a certain part of the template area as well as define its dimensions lower than the actual product’s. This is where you use the offset form shown above. 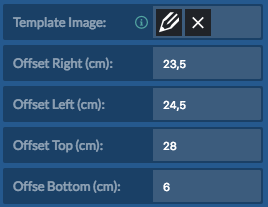 So for a T-Shirt design, you might want your customers to only design near the chest area; you simply make use of the offset for to offset the Canvas to that area as well as define a smaller width and height from the actual product width and height which in that case will be the template. In a plain design like a Business Card, where those define the actual card dimensions, the canvas is the actual size of the product. Foreground: This is the topmost layer and is used mainly for masking out the design canvas. It can only contain an image, just like the Template layer but can be printed or not depending on the option selected after setting the image. So where do we get to use a Foreground image? Well, in creating designs like a MousePad where the user can design on an actual mouse pad image with the design area (Canvas) masked out in a png transparency spot as shown below. The “Design Here” spot is actually the Main Canvas being revealed by a transparent section of the Foreground PNG image. Kindly note, it makes sense to only upload and apply partly transparent PNG files as foreground image because a Jpeg does not have transparent spots and as such, will cover up the whole of the Canvas and nothing will be shown. 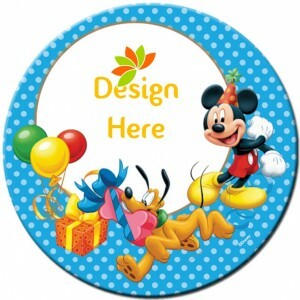 Template Designs – Mostly product print-on designs like T-Shirts, Mugs, Caps, Rugs, Book Covers, Car Stickers, Sign Boards, Roll-Up banners etc, where you want them to see the design in an environment. The environment here is set using the template picture. If you have any design idea and need assistance on how to implement it, you can mail us and will see how it can fit into any of the three categories listed above. You can also check out our Solutions Section to read tutorials on how to create common as well as complex designs.